Cathie Filian: Whip Up A Holiday Tee for Baby! Whip Up A Holiday Tee for Baby! 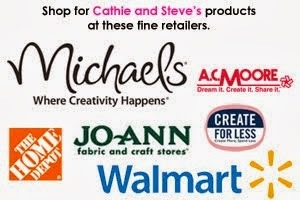 These projects are from my book, 101 Snappy Fashions! Holiday tee aren't just for grown ups! 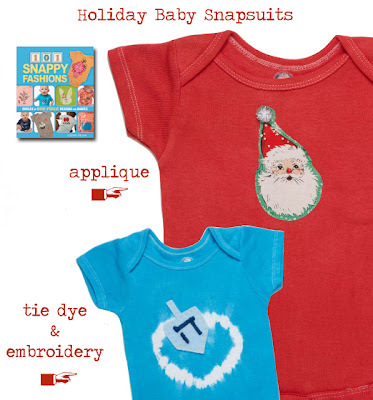 Whip up a plain baby snapsuit (Gerber Onesies) into a holiday themed one with applique, tie-dye and embroidery. 1. Using an iron, attach fusible webbing to the back of Santa themed fabric. Cut around the Santa motif. Position the motif in the top center of the snapsuit and attach with an iron. 2. Sew around the Santa motif with a straight, zig-zag or satin stitch. If you don't have a machine, hand sew to secure the edges with thread or embroidery floss. 3. Hand sew a pom-pom to the top of Santa's hat. 1. Using a rubber-band and turquoise fabric dye, tie-dye a circle in the front center of a snapsuit. 2. Cut a dreidel shape from felt. Position the shape in the dyed circle. Using a satin stitch, embroider the the Hebrew letter Nun, the Gimel, Hei, or Shin over the felt shape. 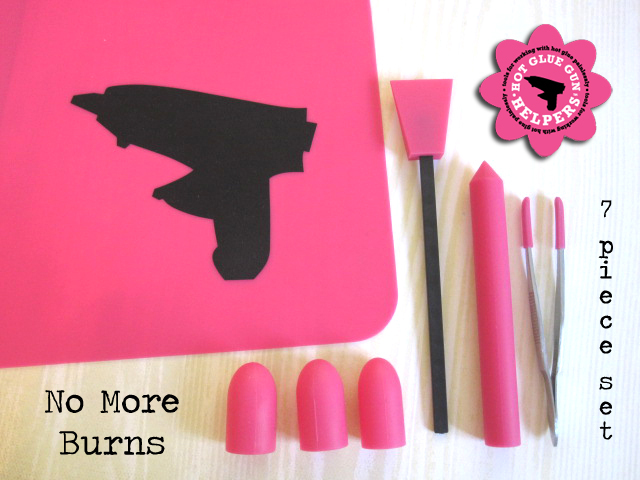 Hot Glue Gun Helpers are now in stock!